Build 7 different versions of the Enterprise! NX-01, NCC-1701, NCC-1701 refit, NCC-1701-B, NCC-1701-C, NCC-1701-D, and NCC-1701-E.
Each includes a base, decals, pennants, and registry letters! 1:2500 scale snap-fit model kit. Enjoy the many versions of the legendary U.S.S. Enterprise with this Star Trek U.S.S. 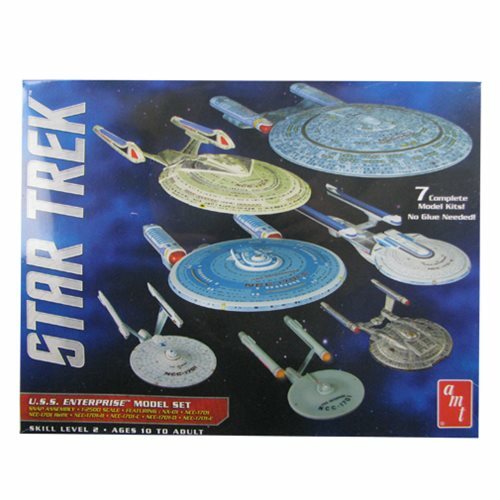 Enterprise 1:2500 Scale Snap-Fit Model Kit! Revisit each generation as you build 7 different ships with this boxed kit. Each 1:2500 scale ship comes with a sturdy base and snap-fit colored parts. Complete each ship with pressure sensitive decals, pennants, and registry letters without the need for water or detailed painting. Expand your galactic collection! Ages 10 and up. Star Trek Starships Best Of #7 U.S.S. Defiant NX-74205 Veh.